The Armory Building in Golden is one of those amazing Colorado structures that you happen upon every now and then. The photo below shows the range of colors and sizes of the cobblestones. 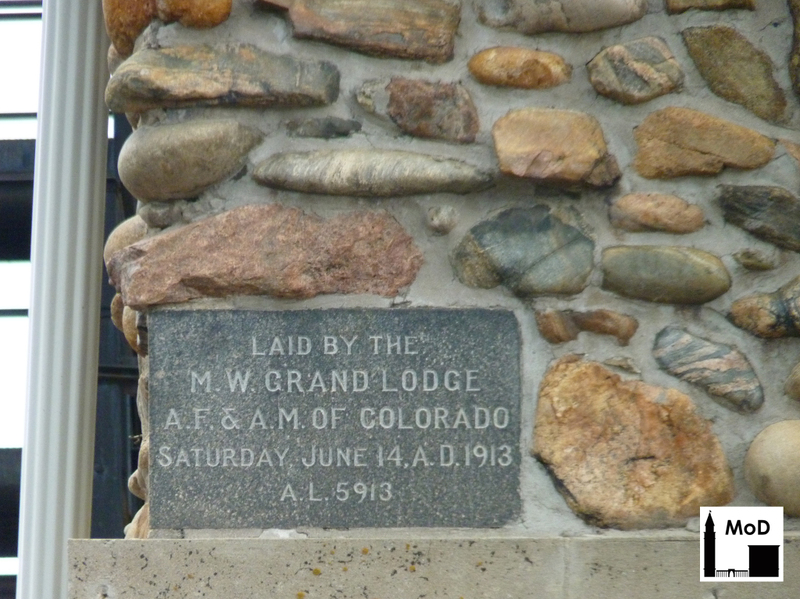 The corner stone indicates the building was dedicated by the Masons, or more specifically the Most Worshipful (M.W.) Grand Lodge of Ancient Free (A.F.) and Accepted Masons (A.M.) of Colorado. Because it is a load-bearing structure, the Armory has incredibly thick walls at the base that get thinner as the building gets taller. 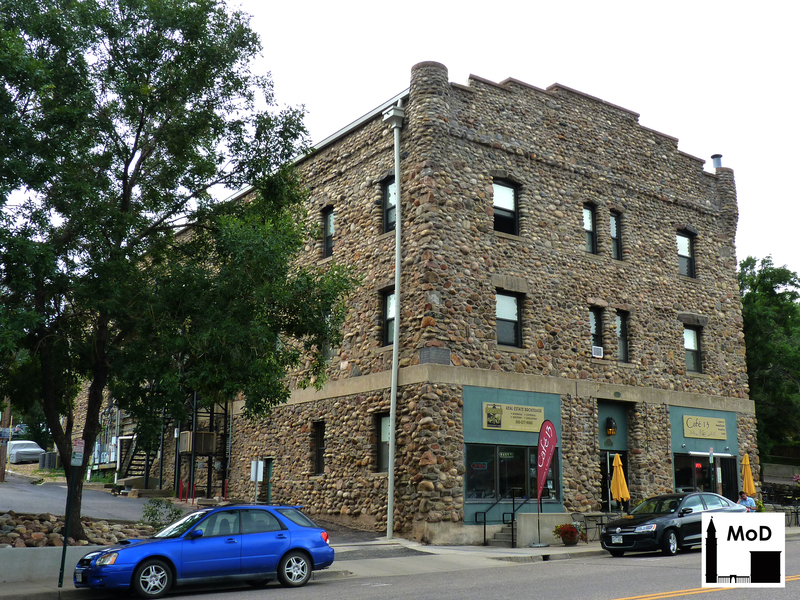 In general, the base of the building was built using larger cobblestones than those used on the upper floors, though large stones can be found throughout the building’s façades. 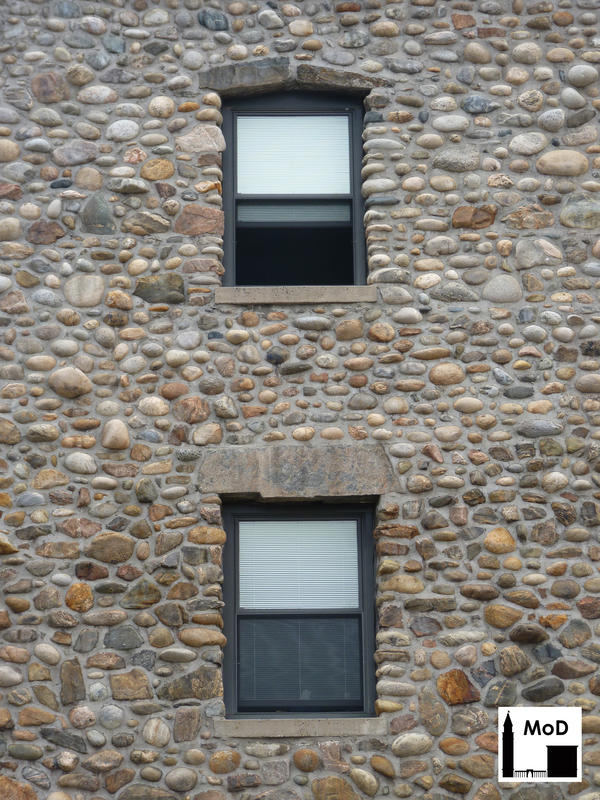 Large cut stones were used at the window lintels, while the sills appear to be cast concrete. It’s interesting to see that the builders used two stones at the upper lintel in the photo below. 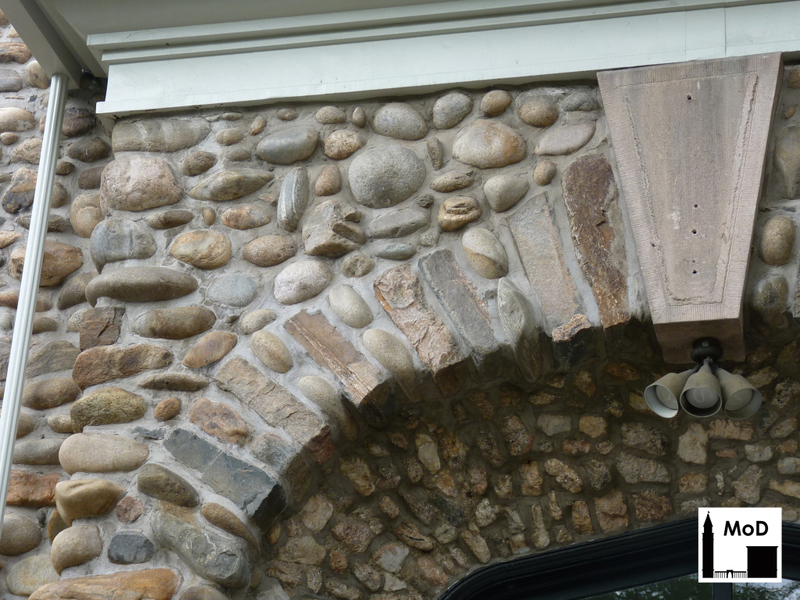 A joint in the middle of a lintel usually reduces the structural integrity of the lintel as the lintel no longer evenly supports the load of the masonry above it. However, in this case, there may be an internal steel beam supporting this lintel, or the angles of the two stones may be enough of an arch to carry the load above. I am not a structural engineer, so I defer to others on this one. I just found it a curious detail. The stones at the arch around the building entrance are a mix of cobblestones and rough cut stones, with what looks like a cast stone keystone at the center. Note the small cobblestones at the intrados of the arch, just above the doorway. They are laid with a darker gray mortar than the mortar used on the rest of the building, which may indicate they were a later addition or simply that they were repointed at a different time. The small stones are much rougher than the other cobblestones, which also makes me think they may have been installed during a different building campaign. 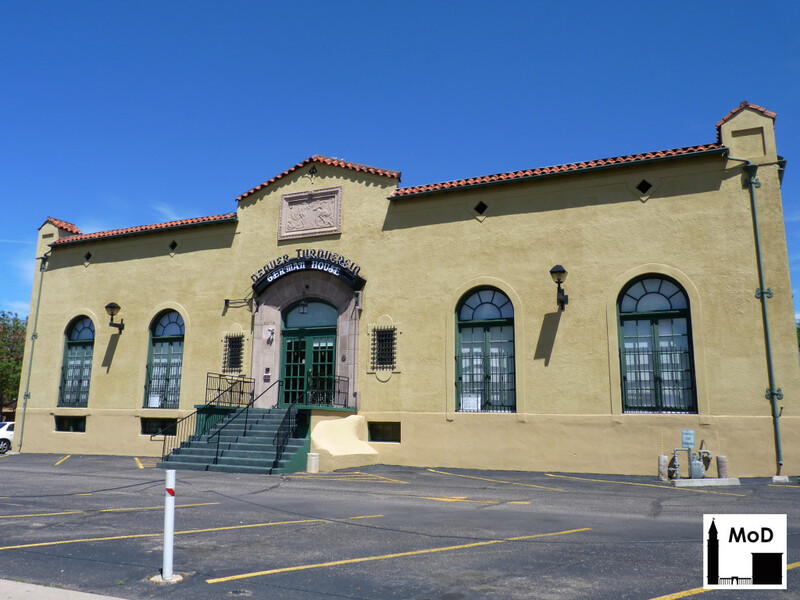 The Armory originally housed the barracks, mess hall, drill hall, auditorium and weapons storage rooms for the Colorado National Guard, but it also included Golden’s post office at the northeast corner of the first level. In 1940, the post office moved out of the Armory, though its walk-in safe is reportedly still located inside the building. During the Spanish Influenza epidemic in 1918, the Armory’s drill hall was used as a Red Cross hospital, and in 1933 it was occupied by the Civil Works Administration. Since World War II, the Armory has housed offices, stores, and even students from the Colorado School of Mines. The exterior of the Armory was restored in 1974, and it was added to the National Register in 1978 [pdf]. It was recently purchased by Calvary Church, though plans for the building have not yet been announced. Hopefully the church recognizes the incredible architectural heritage they now own, in addition to their wonderful 1867 church building. The Paramount Theater on Glenarm Street in Downtown Denver is a visual treat. 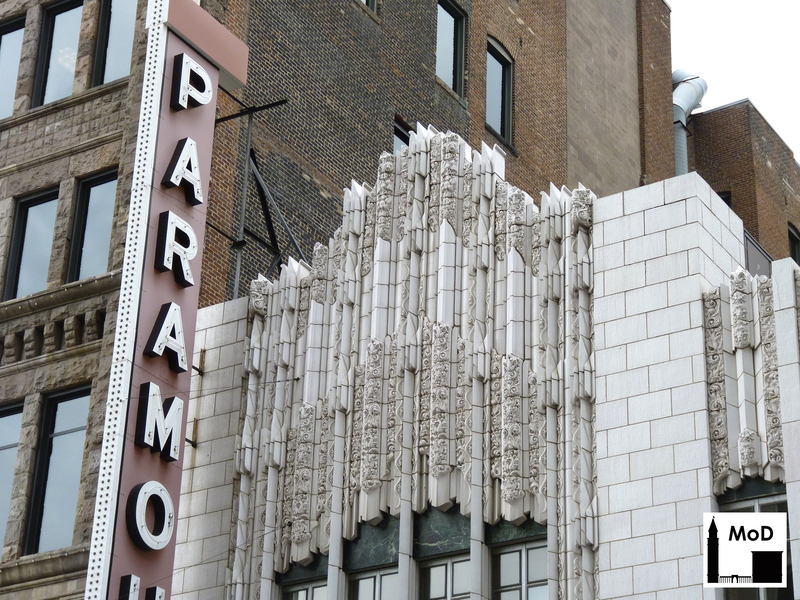 Originally constructed as a silent movie theater, the Paramount was designed by Denver architect Temple Buell [pdf] in the Art Deco style for the Publix Theater chain. It was constructed in 1930 in a period of transition as the motion picture industry moved from silent films to ‘talkies’. The main entrance of the Paramount Theater was originally through the Kittredge Building on 16th Street (as you can see in this historic photograph), while a secondary entrance was located in the theater and office portion of the building on Glenarm Place. This configuration was later altered with a marquee and neon blade sign running down the southeast corner of the Glenarm façade. 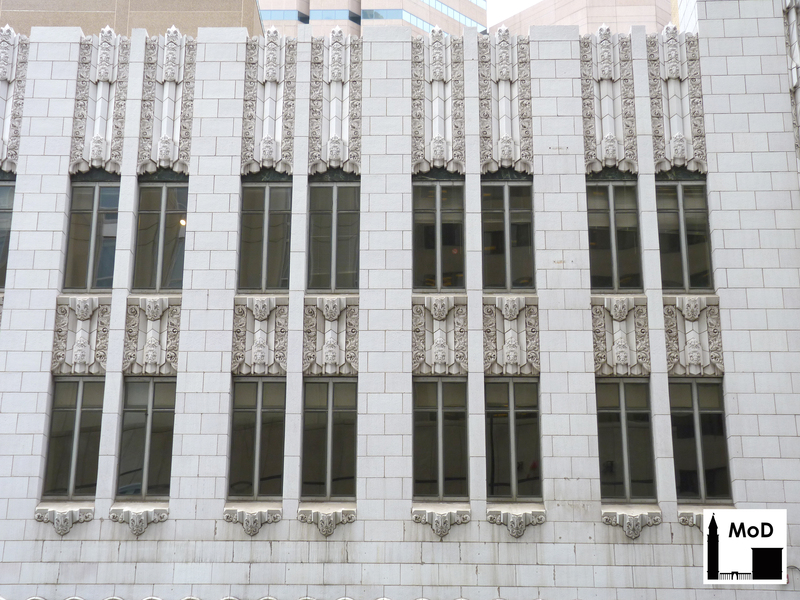 The National Register nomination [pdf] for the Paramount Theater indicates that the façade was erected using cast concrete blocks with glazed terra-cotta ornament. 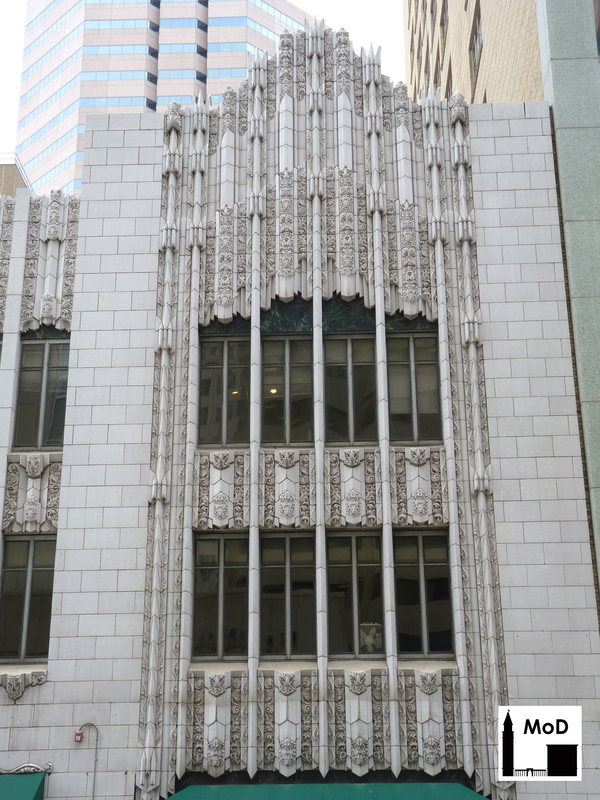 I was surprised to find that out, as the entire façade looks like glazed terra cotta to me. I would guess that if any portion of the façade is cast stone, it is the masonry piers. Whatever their material, they have an interesting texture of irregular, vertically-oriented striations that mimic natural sandstone laid with its bedding plains perpendicular to the ground. The vertical striations of the cast stone also bring the eye to the top of the building, which is crowned by this wonderful geometric- and floral-patterned parapet. 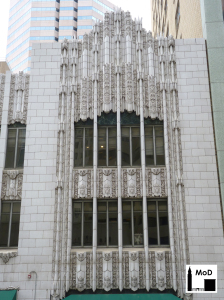 The theater also has ornate spandrel panels and window sills. 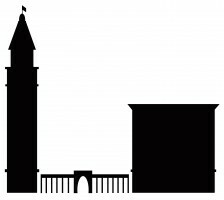 The central portion of the façade is flanked by two taller tower-like features, which also add verticality to the three-story building. Each of these end ‘towers’ have thin mullions between each window opening, rising to a chevron shaped parapet executed in richly ornamented terra cotta. The terra cotta was fabricated by the Denver Terra Cotta Company and was sculpted by Julius Peter Ambrusch, their celebrated in-house artist. Ambrusch, an Austrian native, emigrated to the United States after the first World War, arriving in Denver in 1923. He worked for the Denver Terra Cotta Company for nineteen years before becoming a three-dimensional scale model maker for the US Bureau of Reclamation. 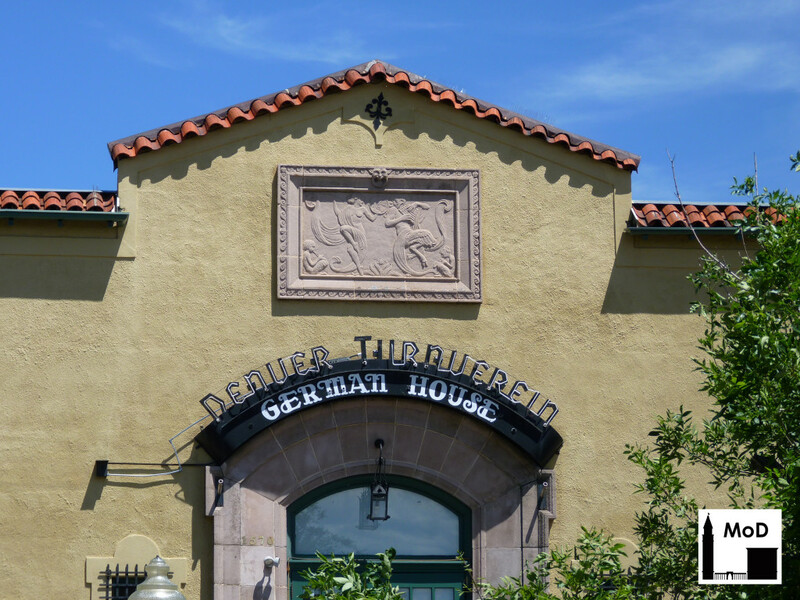 Ambrusch’s artistic talents can be found on terra-cotta buildings throughout Denver, the Front Range, and the Western states. 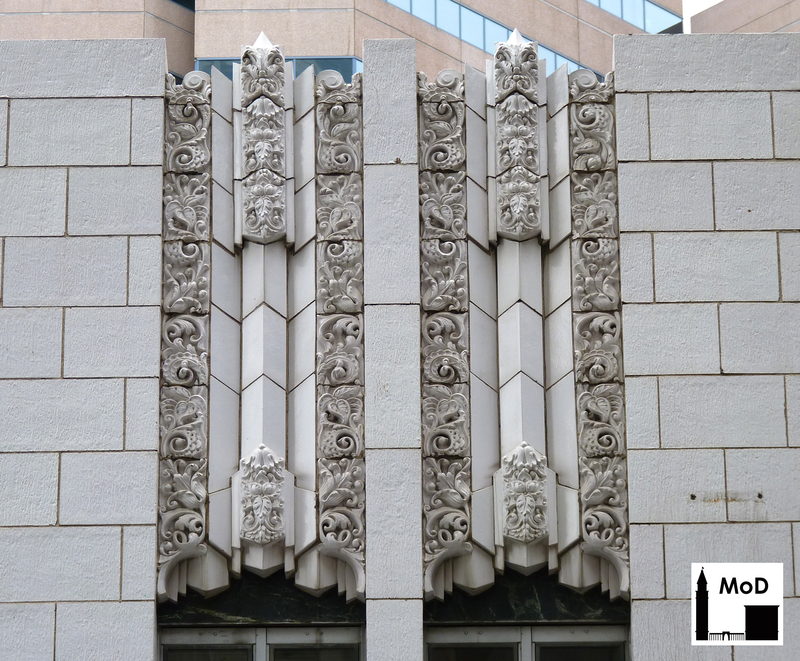 The terra-cotta ornament on the Paramount Theater features “recurrent motifs of rosettes, leaves, feathers, and fiddle-head ferns”. (Source: National Register nomination [pdf]) If you look closely at the photo below, you will see all three masonry features present on the theater’s façade: the vertically striated blocks of the piers; the smooth, zig-zag shaped terra cotta; and the richly sculpted ornament created by Ambrusch. 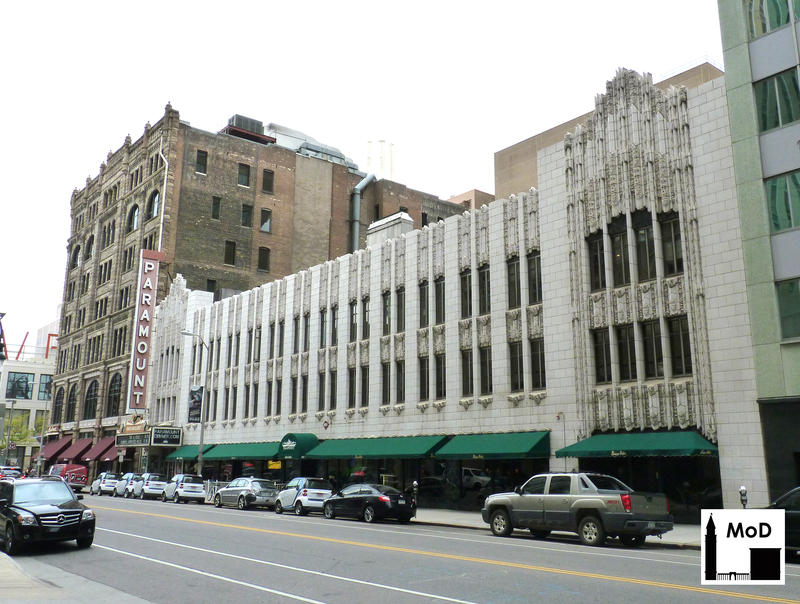 The building was saved from demolition in about 1980 by a group called the Friends of the Paramount with support by Historic Denver, Inc. 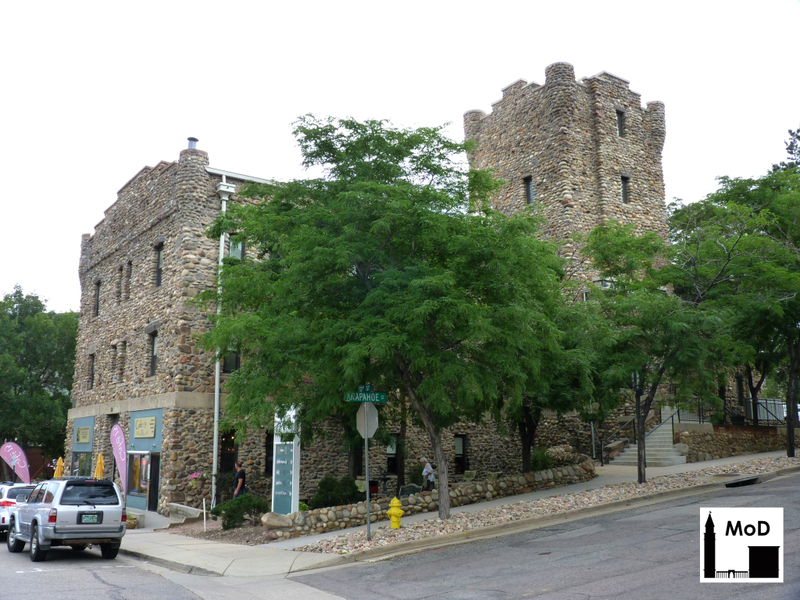 It is a Denver city landmark and is on the National Register of Historic Places. The Paramount Theater no longer shows movies but is used as a concert hall and an events venue. The Paramount Theater has one of two remaining Wurlitzer organs still in use in the United States; the other being at New York City’s Radio City Music Hall. The Paramount’s twin-console Wurlitzer organ, which used to accompany silent movies, has been restored. 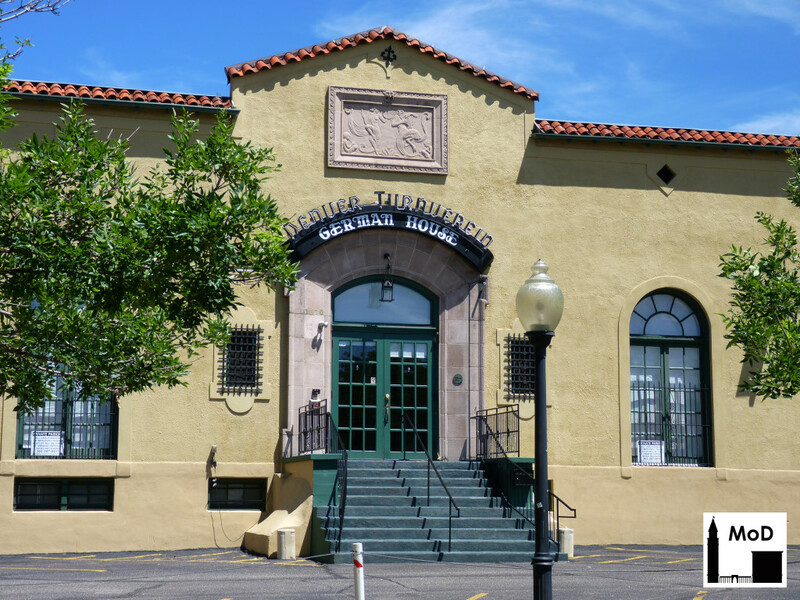 Although I do not have any photographs of the interior of the theater, but the Western History Collection of the Denver Public Library has an extensive collection of historic photographs of the interior and exterior of the building. If you do not have a chance to visit the theater during a concert or event, I hope it will once again be open to the public next spring during Doors Open Denver.